Package of 8 party invitations and envelopes! CAT in the HAT! 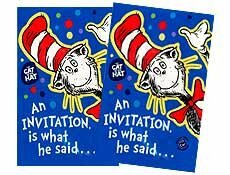 Front reads "An invitations is what he said ....." Inside reads "from the CAT gone wild with a HAT on." Includes lines for: FOR; DATE TIME: PLACE; and RSVP. 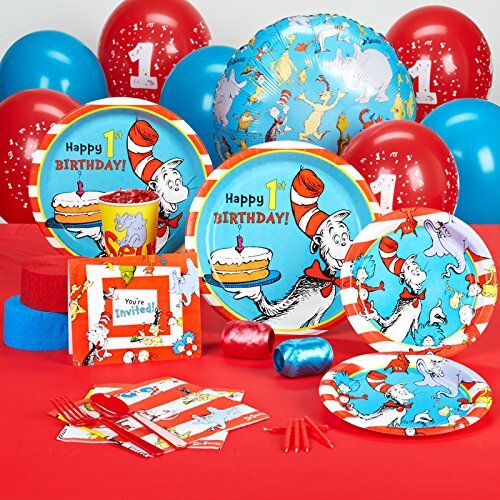 Standard Pack for 16 includes: 16 invitations, dinner plates, dessert plates, cups, forks, spoons, 32 napkins, solid-color tablecover, foil balloon, 12 balloons (2 colors), curling ribbon (2 colors), crepe paper rolls (2 colors), and cake candles. 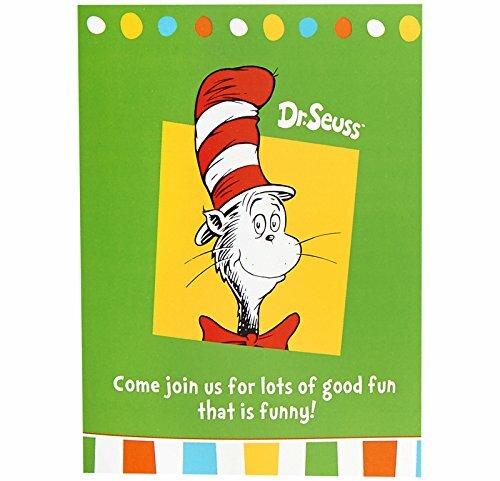 Dr Seuss Favorites Package includes (8) invitations (with envelopes) to match your party theme. Package includes 8 invitations (with envelopes). 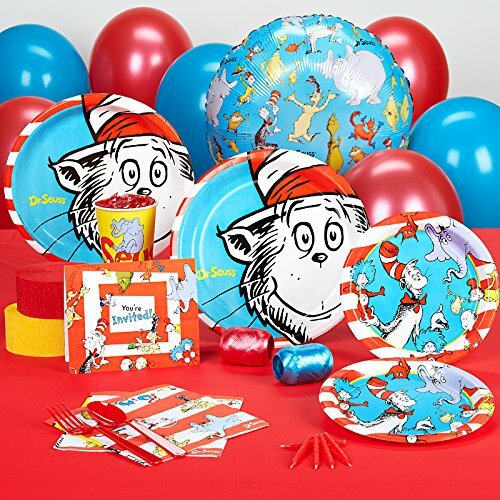 This product is officially licensed by Dr. Seuss Properties Dr. Seuss Enterprises, L.P. All Rights Reserved. 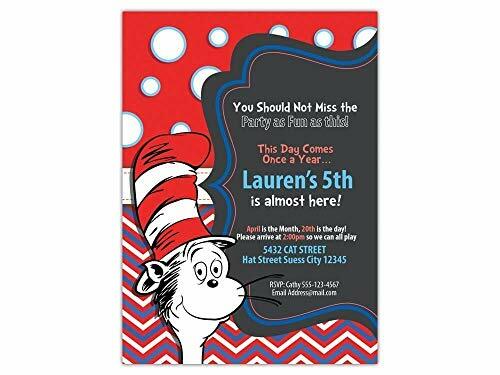 DESCRIPTION > Custom Cat in the Hat Birthday Invitations in 10pc-60pc 5x7" or 4x6" > Front and Backside Included > White Envelopes Included > Print on a Premium 100-lb. 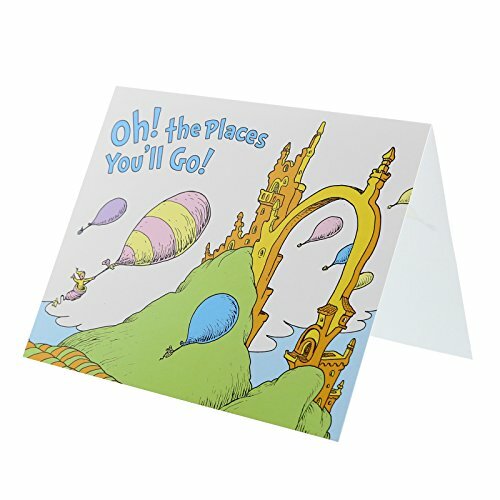 (265 gsm) Card Stock.> Matte or Glossy Finish HOW TO ORDER > Click on the Select Options. > Select Sizes, Select Paper Type and Enter your party details. 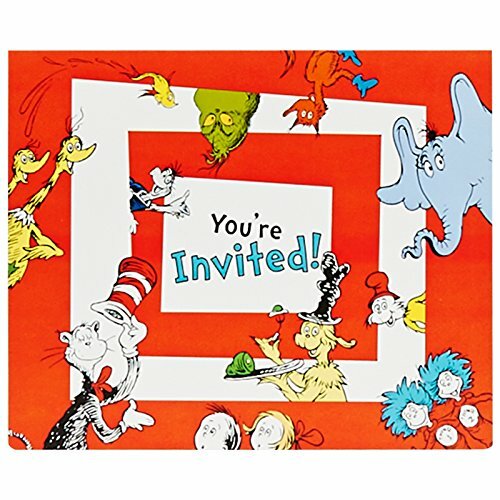 > Once your Order is CLEAR we'll start personalized your invitation. > Your order will set to print and be ready within 3 business days (excluded Saturday and Sunday). > Once the printed invitations are READY, it will be ship through USPS or UPS and usually delivers within 5-8 business days (excluded Saturday and Sunday). > We'll provide tracking number once available so you can track your package. NOTE: We don't send proof to avoid delays. Please DOUBLE CHECK your spelling & punctuation. Be sure to submit the wording EXACTLY as you would like it to view on the invitation.